Suffering from spinal stenosis? An explanation that gets to the underlying cause will help you make changes to overcome it. Spinal Stenosis (or lumbar spinal stenosis) is the narrowing of the spinal canal that can put pressure on the spinal cord or the nerves branching from it. Stenosis in the lumbar (lower back) area affects mostly people more than 40 years and men and women about equally. It can also occur in the cervical area of the spine. 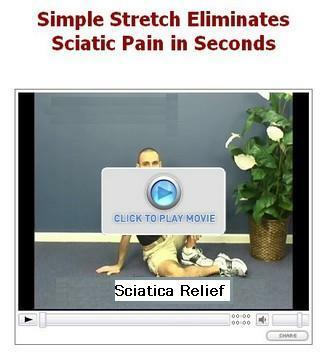 It can lead to sciatica. Ligaments (tough connective tissues between the bones in the spine) can thicken causing pressure on the nerves. Spurs (small growths) may develop on the bones and expand into the spinal canal. The facet joints (flat surfaces on the vertebra) may begin to thicken. Injuries may dislocate the spine and the spinal canal or cause fractures resulting in bone fragments that penetrate the canal. Developmental deformities can result in a spinal canal that is too small. Also, vertebral deformities can narrow the spinal canal. Fluorosis (from excessive exposure to fluoride) may lead to calcified spinal ligaments or softened bones that can, in turn, produce spinal stenosis. Exposure may be from chronic inhalation of industrial dusts or gases contaminated with fluorides, prolonged drinking of fluoridated water, or accidental ingestion of insecticides. An abnormal curvature of the spine can also narrow the space available for the spinal cord. Other possible causes include a herniated disc, osteoporosis, scar tissue build up or a tumor. If you have pinched sciatic nerve symptoms from spinal stenosis then it is quite likely that those muscle imbalances are pulling your hip and spine into an abnormal position which then narrows the space and causes the pressure. If you have spinal stenosis, it is very important to ensure that you maintain a spinal curvature as close to normal as possible. The more the spine is curved due to postural or other problems, the tighter the space becomes in the spinal canal. It is very important to identify and deal with any muscle imbalance. the help you can get. The level, frequency and intensity of symptoms will vary. 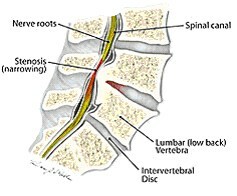 Stenosis on its own, the narrowing of the spinal canal, will not necessarily produce pain.. The frequency and intensity will also vary. The condition itself does not necessarily mean you have to experience negative symptoms. However, when coupled with inflammation, poor posture and the activities of daily living that strain the back, one can certainly experience the symptoms of pain, numbness and stiffness (which are all also symptoms of Sciatica). Diagnosis typically involves taking a medical history, a physical examination to assess range of motion and any of these tests: x-ray, MRI, CAT scan, myelogram and bone scan. Treatments often involve restricting movement, corticosteroid injections to help reduce swelling and drugs such as acetaminophen (Tylenol), and non-steroidal anti-inflammatory drugs (NSAIDs). Non-drug approaches may include heating pads , ultrasound, electrical stimulation, therapeutic exercises, massage or use of a hot tub. Ultimately, if it is not resolved, surgery may be considered. Many times, traditional medical treatments fail to bring long-term relief because of a failure to address the root cause of the problem. Trigger point therapy can be self-administered. If you have spinal stenosis you will have trigger points. Muscle balance therapy is ideal to follow the trigger point therapy in order to restore balance and proper function of the muscles and joints. Exercise for spinal stenosis, done properly, can be a great help. Far-infrared heat can be very relaxing and helpful as it is deep-penetrating and dramatically improves blood flow. It can improve range of motion and bring very quick relief. Ice and/or heat can help control inflammation, pain and stiffness. Proteolytic enzyme therapy can be very beneficial as it helps to battle inflammation and control symptoms. 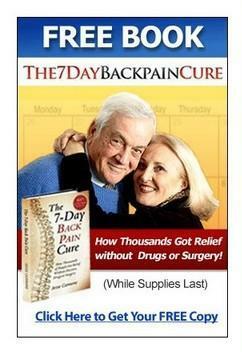 Here is a Pain Relief System (click on one of the two links/pictures below for more information) that is proven and backed up by thousands of stories of real life pain relief (read some examples). It's a system that teaches YOU how your body works, how to identify the cause of your pain and the exact steps you can take to eliminate it! With this system you will learn how you to eliminate any back/sciatic pain you have now as well as how to prevent future pain. Being better informed, you will also know the right questions to ask if you visit a doctor, chiropractor or physical therapist in the future. Make a decision to take control of your own health today. Free book and more information. Very helpful video and much more.